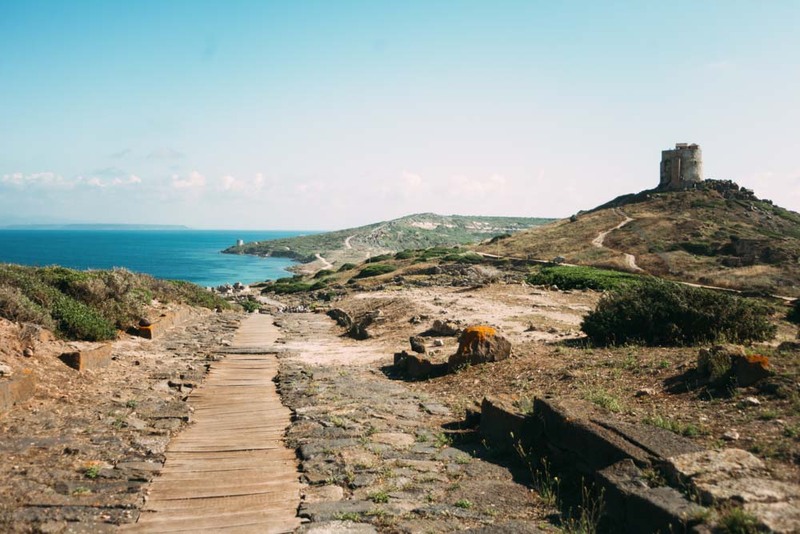 The ancient town of Tharros in Sardinia (photo: Annemique De Kroon). You should never refuse a drink in Sardinia unless you have a very good excuse! Santa Maria di Betlem cathedral in Sassari, north-west Sardinia. Porceddu, a Sardinian roasted pig speciality you have to try. You’ll find a lovely beach at Torre del Porticciolo, just north of Alghero. Embrace the sweet and slow pace of life in Sardinia, with its pretty pastel-hued houses, green landscapes and fluffy sheep (photo: Annemique De Kroon). 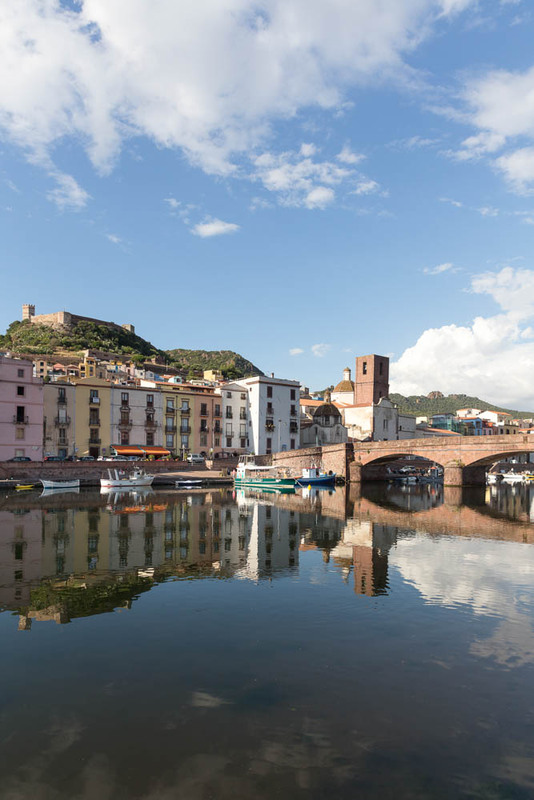 The pastel-hued houses of Bosa and its castle along the river Temo. 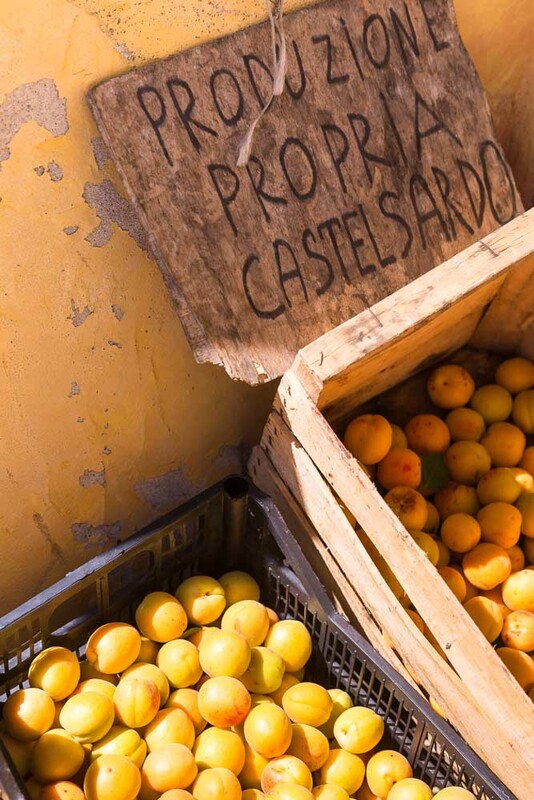 Fresh fruit for sale on the streets of Sardinia (photo: Annemique De Kroon). 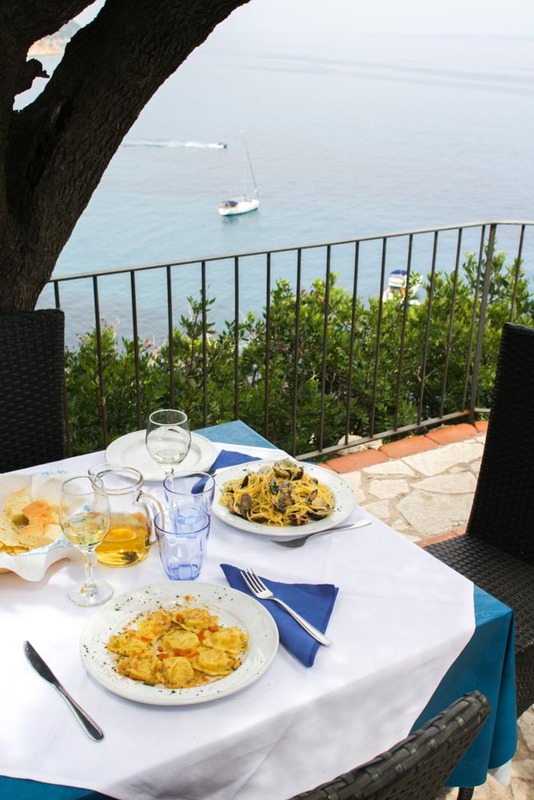 You’ll find typical pasta dishes alongside the more rustic Sardinian cuisine. 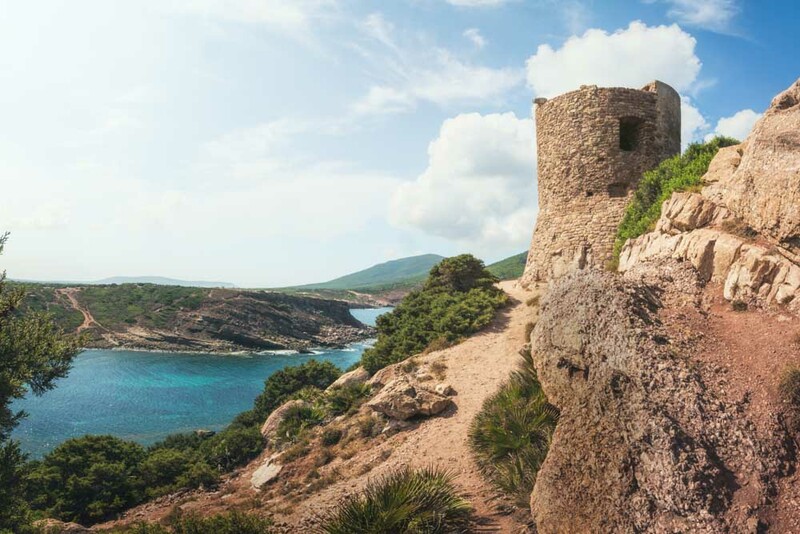 Delicious rustic fare, a love of a glass of wine or two, and a gloriously slow pace of life make Sardinia more than worth the extra hop from Rome. Words Lynn Gail. There’s no label on the screw-capped two-litre wine bottle that’s served in white plastic cups, and it doesn’t matter. I’m sitting under a century-old oak tree being served a traditional shepherd’s lunch in the rugged mountainous Barbagia region of Sardinia. The table is laden with platters of soft goat’s cheese, pane carasau – a traditional flatbread – salamis, chunky bread, olives and delicately sliced prosciutto, and this is just for appetisers. I’ve been warned a shepherd’s lunch can extend long into the afternoon. It’s as though I’ve stepped back 100 years, and it’s pure disconnected, no-internet bliss. Being June and late spring there’s a scent of summer. Cow bells clang metres away as cattle wander free range and piglets chase their mothers up the mountain – it could be a scene from a Disney movie, except one family member is roasting on a spit. Disney, though, does not sum up the past. This is tough-as-nails territory where banditry was king and shepherds lived in a harsh, isolated environment. Distrustful of newcomers, people used to have to earn the respect of the natives. The past is long forgotten though as the shepherds’ children place large pots of hearty stew on the table. Already, we are like old friends catching up, as banter is shared across the table. 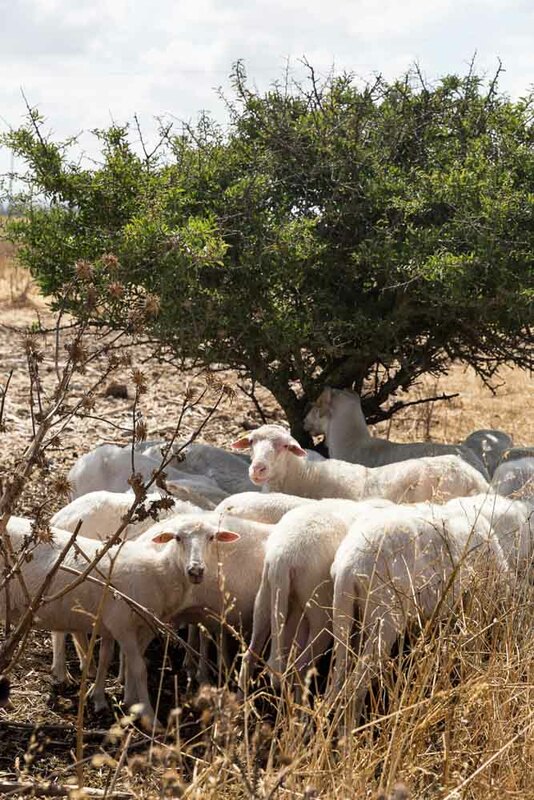 Shepherd Marco brings out Sardinia’s most popular liqueur. “Mirto helps to make the nap,” he grins. Made from the myrtle leaf and berry, it is served throughout the island in every home for every occasion, and often for no occasion at all. It’s the perfect accompaniment to corbezzolo, a mouth-watering dessert of ricotta cheese drizzled with bitter-sweet honey, generously spread on flatbread. Ezio Manuel watches my expression as I bite into this simple, yet seductive Sardinian treat. The three flavours are divine together. “The honey makes you think the sweetness will come – but it never arrives,” he muses. Our farewell is bitter-sweet too; the shepherd’s warm-hearted welcoming spirit has been filled with generosity, and as we depart we promise to return. The following morning we travel to the cobbled alleyways of Mamoiada where we meet Franco as he heaves 30 kilograms of cowbells over his shaggy sheepskin cloak and morphs from man to mamuthone. The mamuthone character, anthropologists believe, is a reflection of the fears these rural men feel and the rituals they perform exorcise the demons for a healthy spring harvest. Franco invites us into his basement to witness a re-enactment of a typical festival performance. The atmosphere quickly becomes frenzied, moving from pin-drop quiet to thunderbolt intensity as he jerks several times along the floor, each cowbell a deafening echo within its shell. Franco explains that during the annual festival fierce men wear gruesome-looking masks and dance around 40 fires three times throughout the village streets to ward off the evil spirits. Each mamuthone carves their own mask from a pear tree, making the expression either emotionless or tragic to ward off bad karma. The tree has to be cut in full moonlight, otherwise the belief is the mask will shatter, bringing bad energy. After 15 minutes Franco is drenched in sweat. As he removes the cowbells and mask with relief, I ask how they survive the two-day festival (an annual event from 16–17 January). The answer quickly becomes apparent as we are invited in for some Cannonau; a glass of local red solves everything! Leaving the quiet cobbled alleyways of Mamoiada, we travel through medieval villages with roads so narrow I breathe in as we navigate tight turns. I concentrate on the local men in grey flat caps sharing gossip over an espresso in the cosy cafes. The villages give way to patchwork green landscapes, ancient ruins and the odd rustic farmhouse. As the fields iron out, we reach the Sinis Peninsula where soft flour-like white sand nuzzles against the rugged western coastline on beaches like Is Arutas. Every shade of aqua has been dropped into the surf and the negative ions have a positive effect as I watch tiny fish flit through the rockpools – the perfect tonic for the travelling soul. It’s undeveloped and unpopulated, apart from a sprinkling of beach umbrellas at the water’s edge. Random tavernas are scattered in a slapdash manner with seemingly no thought to landscape design. The food, though, has been carefully crafted. The seafood salad I order is a delicious mixture of octopus, mussels, squid and crab with goat’s cheese and olives and tastes like it has come straight from the fisherman’s haul. Close by on the peninsula are the remains of an original Nuraghe settlement at the archaeological site of Tharros. The Nuragic people constructed these pre-historic monuments around 1900–730BC with more than 7000 sites still remaining across Sardinia. The complex settlements have baffled archaeologists for years as they’ve tried to understand the intellectual genius of such ancient engineering minds. From the intact remains they know the fortified constructions were used as watchtowers and housed large communities. Designed with rooms, stairs and intricate water wells, the inventors maximised the use of internal space. They were talented artisans too, creating detailed jewellery and ceramics. As the sun sets over the ancient port I find it difficult to imagine the precise workmanship that occurred more than 2500 years ago. The next day we meander through farm-edged roads to the village of Bosa, where long, thin pastel-coloured houses climb a steep hill to an imposing 12th-century castle. The scene resembles something from a child’s pop-up picture book. It’s all perfectly put together and fringed by the river Temo, where blue and white fishing boats gently tug at the water’s edge. As we arrive, cafes and restaurants are opening market umbrellas ready to catch the day’s chatter. The Sards have a rule: it’s considered a ‘thou-shalt-not’ to drink cappuccino after 11am. It’s the perfect excuse to enjoy one before we explore the alleyways. 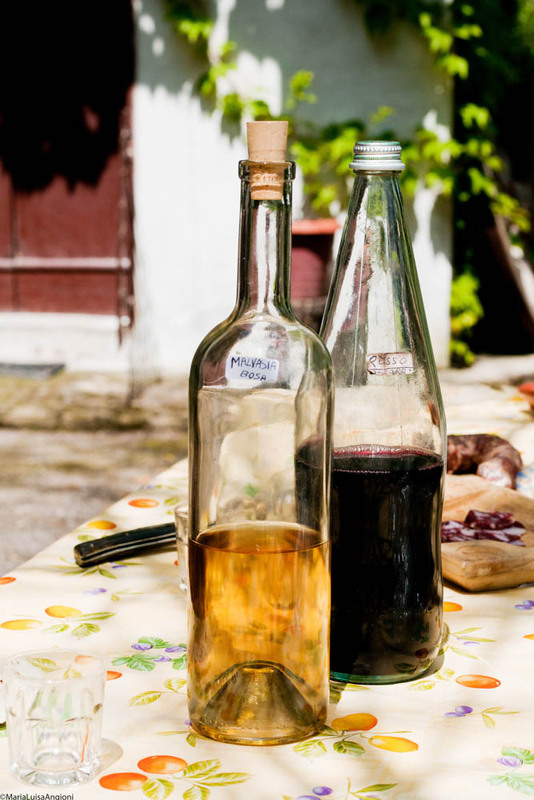 Sebastiano, a bed-and-breakfast owner in the village, invites us onto his roof-top terrace for a drop of the famed filu ’e ferru, a brandy made from grape skins that can reach 52 per cent alcohol. Forbidden to produce, distillers buried the containers underground and the only way it was located was by a thin iron file (filu ’e ferru). “Even the processing steam will make you drunk. It kills everything off as it goes down,” Sebastiano claims. Another rule in these parts: never refuse a drink from a Sard unless you have an excellent excuse. Not wanting to offend, I’m relieved when he brings out miniature shot glasses. The fire water warms me immediately adding to the mellow atmosphere. Our final day is spent exploring Alghero, Sardinia’s most vibrant town, with its bustling medieval alleyways and ritzy harbour. The historical centre is one of the best preserved, and we wander in and out of churches, boutiques and restaurants where I find Catalan, an old form of Sardinian language, on the menu. As we stroll along the fortified 16th-century sea wall, and past yachts bobbing on the Mediterranean, I realise why Sards are likely to live for more than 100 years. Restaurant shutters are opening post-siesta, no one is in a hurry, and people are socialising over a glass of wine. And it’s all happening on Sardinian time, where hours (days, weeks, years…) drift in and out to the rhythm of the tides. Several airlines fly from Australia to Rome including Etihad, Emirates, Virgin Australia, Alitalia and Qatar; prices start around $1950. Alitalia fly from Rome (from Fiumicino Airport) to Alghero, Sardinia five times a day for around $200. April to June and September to October is quieter with cheaper accommodation. It can be chilly, but it’s an excellent time for exploring the island. From July to August, room rates are higher and the crowds arrive; the perfect time for the beach. 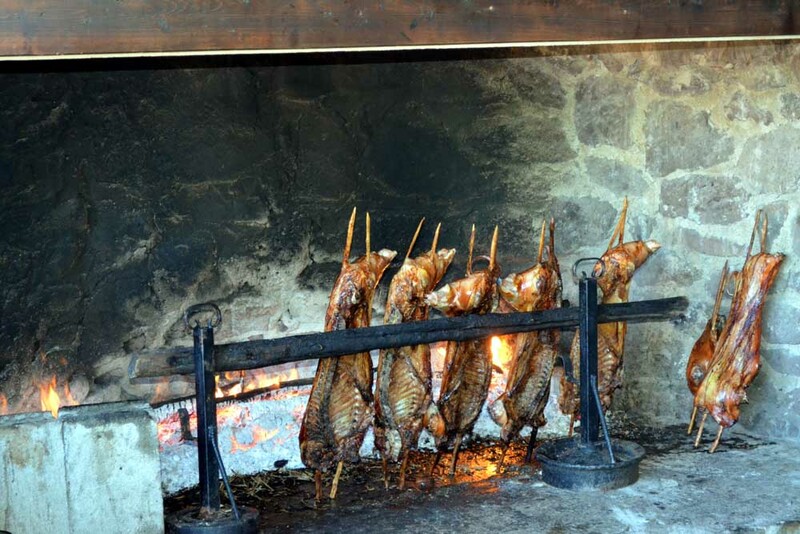 Indulge in the Shepherd’s lunch (gaveena.com) in the Barbagia region, while in Nuoro you should definitely try Ristorante Enoteca Ciusa for fine dining. 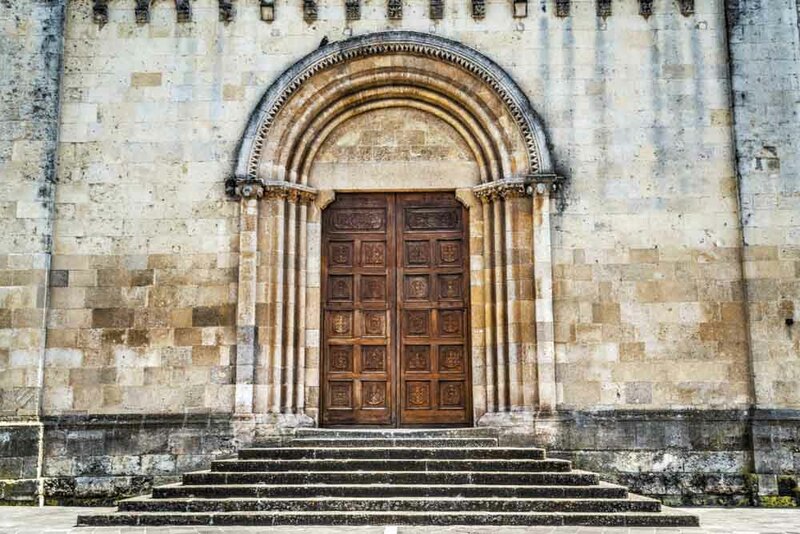 Bosa: Discover this ancient village, with its medieval alleyways and rainbow-hued houses. Cabras: Home to the island’s most stunning beaches. Museo delle Maschere Mediterranee: Visit the remarkable Mamuthone museum. Capo Caccia, Alghero: Descend 600 steps through vertical cliffs to reach Le Grotte di Nettuno (limestone caves).